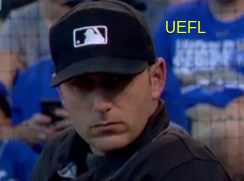 Presenting the UEFL Profile of MLB Umpire Pat Hoberg. Ejection 082 (MIN M Paul Molitor; QOC = N). Ejection 070 (HOU LF Marwin Gonzalez; QOC = Y). Ejection 045 (NYY M Aaron Boone; QOC = Y). Ejection 156 (BAL CF Adam Jones; QOC = Y). Ejection 129 (COL 3B Nolan Arenado; QOC = Y). Ejection 173 (LAA M Mike Scioscia; QOC = U). Ejection 172 (LAA P Brett Oberholtzer; QOC = U). Ejection 157 (PIT LF Gregory Polanco; QOC = Y). Ejection 150 (TOR M John Gibbons; QOC = Y). Ejection 130 (CWS PC Don Cooper; QOC = Y). Ejection 117 (PHI BC Larry Bowa; QOC = N). Ejection 102 (LAD M Dave Roberts; QOC = Y). Ejection 120 (STL M Mike Matheny; QOC = Y). Ejection 119 (STL C Yadier Molina; QOC = Y). Ejection 118 (STL P Seth Maness; QOC = Y). Ejection History: 1 (2014), 3 (2015), 7 (2016), 2 (2017), 3 (2018). Notes: Called Jake Arrieta's August 30, 2015 no-hitter, as a Minor League call-up umpire. » Graduated from the Jim Evans Academy of Professional Umpiring (JEAPU) in 2009.